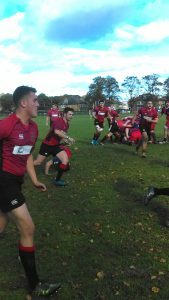 Linlithgow travelled to RHC last Saturday looking to improve their league position. With last week’s try hero Jack Frame injured, the backs had an unfamiliar look to them, with a Reds debut for Ross Tulloch on the wing and a second start for Gregor Stewart in the centre. Both youngsters have just stepped up from last season’s u18 team. The Reds were too fast for the camera man! Linlithgow kicked off up the slight slope, with the wind blowing across the field. The early exchanges were shared, and once RHC had hit the post with their first penalty attempt, they started to take control of the game. It wasn’t a surprise when they scored a good try and the conversion made it 7-0 to the hosts. 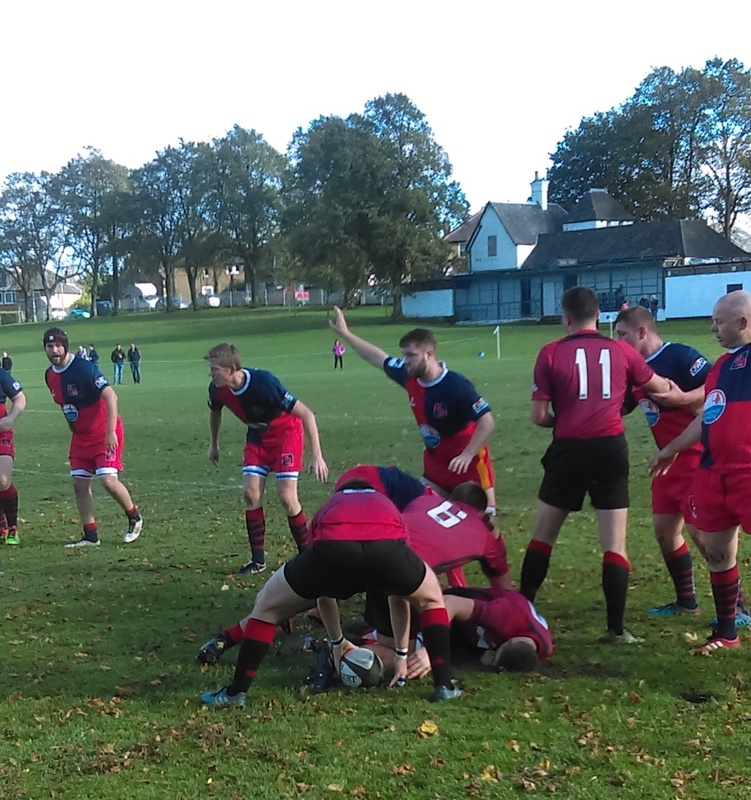 Linlithgow seemed sluggish and there were a multitude of errors in the game which get the referee’s whistle busy! Linlithgow came back into the game and the longer the half went on, you felt that they would score. Twice they had penalties in front of the posts and chose not to kick, which caused consternation among the spectators and coaching staff. With the last play of the half, Linlithgow passed up a third opportunity to kick a penalty, however at least Ross Tulloch went over in the corner, although the conversion was missed. Half time 7-5 for RHC, which did not really reflect the balance of play. The second half went better for Linlithgow, but not before the referee yellow carded one player from each side for getting their handbags out. The Reds seemed to capitalise more as Gregor Stewart went over in the corner, followed by a super conversion from Chris Ronalson out wide. Lauchlan McCall came on for only his second game for the Reds, and Linlithgow missed a penalty with Chris Ronalson hitting the post. The Reds were well on top now, but as the half wore on the lead was still only 5 points. Eventually, following a break by Cal Thompson, a couple of phases later saw Euan Mochrie make the points safe with a fine try, the conversion being missed. With the referee looking at his watch, Linlithgow just had time to get the bonus point with Gregor Stewart scoring in the corner, the conversion falling just short. A great win for the Reds, however RHC put a lot into the game and will probably think they should have taken at least a losing point from it. However, onwards and upwards for Linlithgow who face Dunbar this Saturday at Mains Park, while the 2s are also at home against Forrester 2s in the reserve league. Both matches kick off at 3pm. Rab Cairns; Cammy Murie, Mark Green, Gregor Stewart, Ross Tulloch; Chris Ronalson, Peter Miller; Ally Mclean, Stuart Cunningham, Mike Robertson; Sean Hagerty, Craig Scott; Euan Mochrie, Ross Martin and Mark Caddle. Subs: Calum McKeown, Cal Thompson, Murray Smith, Lauchlan McCall.